BANGKOK: Prominent British rights activist Andy Hall left Thailand early today (Nov 7), saying he feared for his safety amidst legal problems and growing harassment from companies that have been “irrational, vindictive and aggressive”. 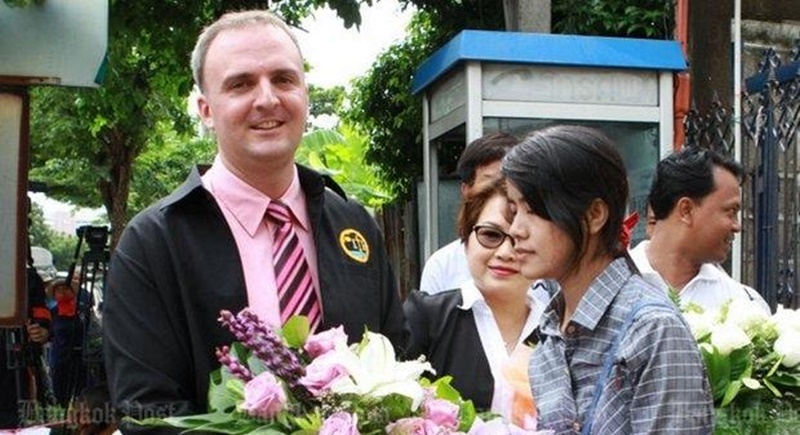 Mr Hall, who has worked on the rights of migrant workers in Thailand for 11 years, has recently faced defamation lawsuits by companies he has accused of labour violations. “The situation is not good right now,” he told the Thomson Reuters Foundation by phone yesterday (Nov 6) before his flight, speaking from Mahachai, a town near Bangkok and the centre of Thailand’s seafood processing industry. In September, Mr Hall was handed a suspended three-year jail term and fined B150,000 ($4,300) for criminally defaming Natural Fruit Company, a pineapple wholesaler that supplies the European Union. Rights groups called the verdict an alarming precedent in the fight against labour exploitation. Emboldened by the ruling, a chicken farmer who lost his EU contracts and had to shut down his 1.6 million-chicken operation after Mr Hall exposed alleged labour violations on one of his three farms, said he planned to pursue his own defamation case and has hired the Natural Fruit lawyer. Supported by Mr Hall, the chicken farm workers had sued the farmer in September, alleging forced overtime, unlawful salary deductions, confiscation of their passports and limited freedom of movement. They demanded $1.3 million in compensation and civil damages. The chicken farmer countered with defamation lawsuits against 14 of the migrant workers, Mr Hall said, adding that he didn’t know if suits had been filed against him or the non-governmental organisation he co-founded, the Migrant Worker Rights Network. Thailand, one of the world’s key food exporters, employs an estimated 3 million migrant workers, mostly from Myanmar. Many migrants face labour violations, such as unpaid wages, confiscated travel documents and limited freedom of movement. Mr Hall’s legal problems began after he conducted research for Helsinki-based Finnwatch for a 2013 report called “Cheap has a high price”. A company in the report, Natural Fruit, filed four defamation cases against Mr Hall. One case related to an interview Mr Hall gave to Al Jazeera in Myanmar in 2013 about the legal fallout of the Finnwatch report. A court in Bangkok dismissed the charges, but Thailand’s attorney general and Natural Fruit appealed. The Supreme Court on Thursday (Nov 3) rejected that appeal. The verdict had originally been scheduled to be read on Nov 25, but Mr Hall said he requested the court to move the date forward because of his increasingly precarious situation. “It’s time for the good companies, the good actors, to speak to these people. I work with a lot of good companies ... I fear for my safety because of the unstable situation. I don’t want to be here another three weeks,” he said. He said once the chicken farmer filed criminal defamation charges against him, he would be subjected to travel restrictions again – another reason to leave now. Meanwhile, he said there had been a clear impact on civil society and freedom of speech, as many watchdogs and activists have warned. “No one dares to say anything about anyone doing anything wrong in Thailand. They just say it’s ‘a factory’, or ‘a company’ in Thailand,” he said. “I want to come back, but it’s a matter of do I have enough support and encouragement to come back? Now I feel very uncomfortable,” he said. Mr Hall left on a Paris-bound flight that departed from Bangkok shortly after midnight today. He has not specified a return date. ...are they also to block and ban all the clothing,bags,shoes belts, products( many designer labels)made in hell house factories in India,Bangladesh,China many middle Eastern countries for EU,UK,International renowned Firms under their Labels marketed as THEIR Products but actually using cheap labour in very poor Countries and charging Exorbitant Prices when reselling under THEIR Labels? The thai feudal 'influentials' are really hard headed an living under century old stones. It is good that the EU contracts of that chicken farmer were cancelled. even it was just a small market player. These chicken farm workers were inhumane treated and sued the chicken farmer. Hope the thai court set a 'international human right' example with this case.